“W” by John Banks is a uniquely crafted tale about a man named Josh Kinninger, whom we follow from his college years, and then to his years as a widowed father who must come to terms with the death of his own estranged father. The novel goes back and forth between Josh’s narrations, letters written by an ancestor on the Oregon Tail, and a telling of how a Viking came to be buried in the mountains of Oregon. Banks’ voice as an author is enchanting, and the message that seems to be conveyed with this novel is that no matter who we are, we all have a story. Josh’s story is not just about him, however, but about his younger brother, recently deceased; his relationship with an openly racist, criminalized father; and how he uses letters found written by his ancestor on the Oregon Trail to his fiancée to make better sense of his own life. What we see Josh realize throughout the course of the novel is that there are a lot of crappy people in the world – people who deserve to be ostracized and made an example of. However, there is also a lot of good in the world, which we can find in our children; our siblings; our parents; and everyone else we meet along the way during our lives. While the concept and execution of Banks’ novel is certainly unique and captivating, it is difficult to figure out, at first, what all the different stories have to do with each other. For about the first 100-150 pages it was disorienting going back-and-forth between the Viking story, Josh’s narrations, and the letters from his ancestor, because it was hard to discern how they all related to each other. The context is dense, and this is certainly a book meant for concentration and deep thought. While I was reading about Josh’s recollections of his father, it caused me to question my own views and evaluate whether I’m as open-minded as I believe myself to be. We all have prejudices, unfortunately, but just how much are these prejudices holding us back from our true potential? This was an interesting, thought provoking book that did end up being enjoyable, but the confusing structure might turn away some readers who may not have the patience to wait 100 pages to get their bearings in the story. A novel can be complex without having a complex structure. A complex plot can be perfectly enjoyable as long as the structure of the actual reading is not tedious and tiresome to the audience. 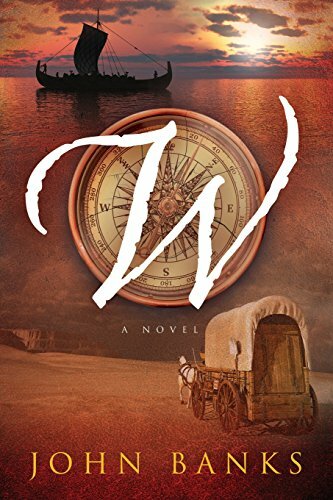 I’d recommend “W” by John Banks to dedicated readers who have patience to figure out a complex plot and who enjoy going on an adventure within their reading choices.